A little “spare” crafting time, 1,000 hot glue gun burns and 394 book pages later and you too can have a wreath like this! Stephanie at Under the Table and Dreaming posted her wreath (and tutorial too!) and I knew it was a project I wanted to tackle. Especially in the same color. Love the black and white pages. I knew it would be perfect “textural” addition to my winter living room. Mine took long enough to complete and isn’t even nearly the size that Stephanie’s is -wow! Mine is much smaller. And honestly….that’s all I had the patience for – HA! The night after I finished it, before I had gotten it hung up my little 2 year old found it, threw it and it ended up like this…..
grrrrr! (insert very unhappy Mommy moment) Luckily a little more hot glue and all is well again. These would be very pretty done up in other colors too – Like all Red, all white, Oh even all yellow for Spring! So – did you craft up anything fun this weekend? You have left me completely speechless!! I love your wreath!! I HAVE to make this – it’s AWESOME. Wonder if I sprayed it with a sealer if I could hang it on the front door? I cried a little at your two year old’s destruction. Glad you were able to fix it. Ouch. 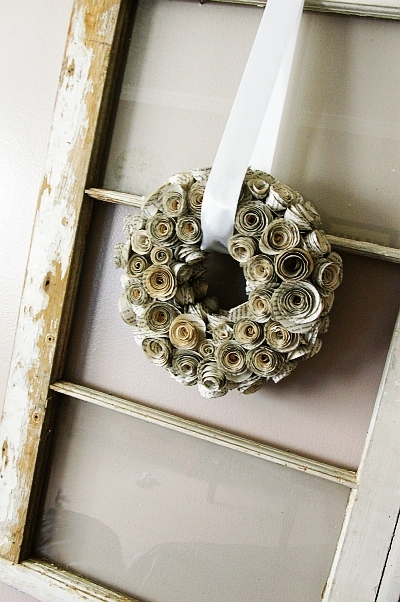 Okay, I love this wreath! 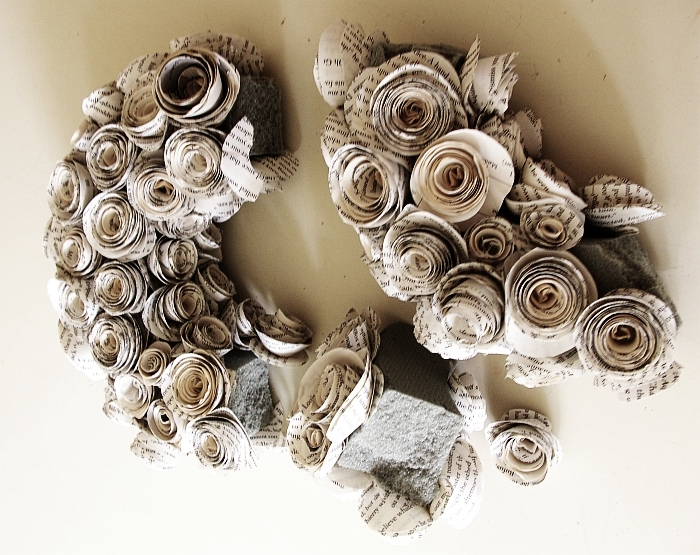 Perhaps my love of reading has something to do with it, but it’s beautiful! Hope your fingers have recovered from those hot glue gun burns! Just so beautiful. I love it. I could have cried when I saw it broken. Mum’s are great menders. Of wreaths and hearts as well. OOOHHH that would be cute in my room I am redoing. Love it. such a great wreath. i saw this too but love your rosettes much more. as always you added a great bit of flare! 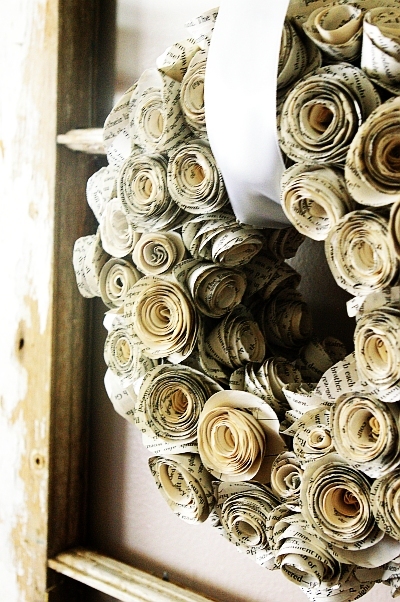 This wreath is amazing! I am going to have to make one myself! This was absolutely GORGEOUS! I’m loving it! wow. beautiful. did you dye the pages with tea to yellow them first? Megan, what an amazing work!!! I totally want this! Great job! Oh goodness! This is RIDICULOUSLY gorgeous and cute! Well done! I think your patience paid off big time! How can I say… I LOVE LOVE LOVE IT! 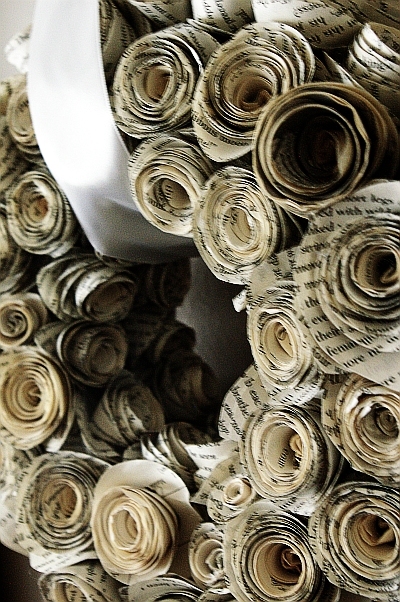 Do you have a tutorial for the beautiful book page wreath?